The UP Manila community honored the life and work of former UP President and Senate President Edgardo J. Angara in a tribute held at the UP Manila Museum of a History of Ideas on July 18, 2018. Senator Edgardo Javier Angara (SEJA) was the 16th president of the Senate of the Philippines and 15th president of the University of the Philippines. He passed away in the morning of May 13, 2018 due to an apparent heart attack at age 83. Among his legislative milestones were the Free High School Act, Commission on Higher Education (CHED), Technical Education and Skills Development Authority (TESDA), the National Health Insurance Act, Senior Citizens Act, the Agriculture and Fisheries Modernization Act (AFMA), the Renewable Energy Act, and the Procurement Reform Act. He also authored the laws creating the National Museum and the National Commission for Culture and the Arts (NCCA), among others. 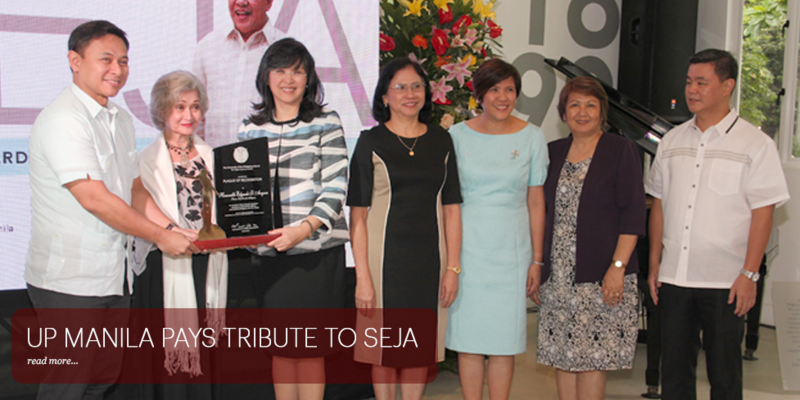 In 1981, SEJA received the Most-Distinguished Alumnus Award from UP and the Highest Professional Award from the UP College of Law. SEJA’s widow, Mrs. Gloria Manalang-Angara, sat in the front row with other dignitaries including her son, Senator Juan Edgardo ‘Sonny’ Angara, UP Vice President for Public Affairs Jose ‘Butch’ Dalisay, Jr., Chancellor Carmencita Padilla, National Scientist Ernesto Domingo, PGH Director Gerardo Legaspi, PhilHealth President Dr. Roy Ferrer and Director Dr. Anthony Leachon, Dr. Zorayda Leopando, Dr. Leo Cubillan, Dr. Gerardo Legaspi, and Dr. Rosel Doval Santos. Known for his advocacies in health, education, economy, and agriculture, the stories shared during the tribute for the late statesman described his contributions to and engagements with UP Manila during the past decades. Dr. Legaspi projected the last text message he received from SEJA reflecting his concern to a Mr. Walter Clemente, a messenger and victim of a motorcycle accident. “It is heartwarming to know that a very busy person like SEJA could have gotten down to the details of all his patients,” said Dr. Legaspi.